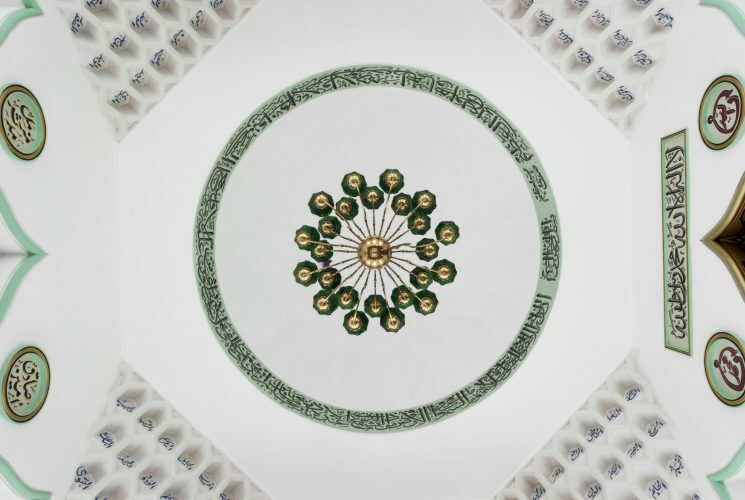 On Tuesday 13 March, Historic England conferred Grade I listed status on the Shah Jahan Mosque in Woking, Surrey, which thereby became the first mosque to receive this status in the country. There had been other registered mosques in the UK before the Woking mosque, the earliest on record being the Liverpool Muslim Institute, which was established in 1887 in a street called Mount Vernon Terrace, and moved to Brougham Terrace in 1889. Brougham Terrace is considered to be the first fully functioning community mosque, but the Shah Jahan Mosque, which was established in the same year (1889), was the first purpose-built mosque in this country, indeed in northern Europe. There are no end of fascinating things about the Shah Jahan Mosque, which owes its name to its principal funder, the female ruler of the Indian princely state of Bhopal, the Sultan Shah Jahan Begum. One is the obvious surprise of its location in Woking, a commuter town in Surrey, 30-odd miles from London, and not the obvious focal point for Islamic worship or study. Another is that, when the mosque was established (in 1889), there were very few Muslims among its worshippers who had been born outside the country: most were white British men and women who had converted to Islam, among them (as listed on the mosque’s website) Lord Headley, Marmaduke Pickthall, David Cowen, Charles Buchanan Hamilton (nephew of James Hamilton, the President of the United States of America), Sir Archibald Hamilton (cousin to King George) and the Shaykh of the British Isles, Abdullah Quilliam, who had been born William Henry Quilliam. A third interesting aspect of the Shah Jahan is that it was designed by an English architect, William Isaac Chambers, who had moved to Dublin in the 1870s (building an elaborate villa for himself there) but who had then returned to England in the mid-1880s to set up an architectural practice in Woking. And a fourth fascinating aspect of the mosque is that the person principally responsible for its establishment was a British-Hungarian Jew, Gottlieb Leitner. Leitner acquired the site of the mosque (previously the site of the Royal Dramatic College) with the intention of building a mosque, a synagogue, a temple and a church in the same area. His early death, at the age of 59, left these plans unfulfilled, and his heirs sold off the land earmarked for the synagogue and the temple; the church was the only other building built – it still stands today as St. Paul’s Church, on (fittingly) Oriental Road. Leitner was an extraordinary man, prodigiously gifted in languages: he was said to have been fluent in at least nine languages by the age of 10 and, later, to have extended this fluency to 10 more languages, while also being able to get around in a further 30. He spent more than 20 years in India, mostly in the Punjab, where he helped to found the University of the Punjab, and where he co-wrote a two-volume History of Islam in Urdu. He returned to Britain in 1881, with the firm intention of establishing a centre for the study of Oriental languages, the first of its kind in Europe. When he died, in 1899, he was acknowledged as the world’s pre-eminent orientalist (a description that nowadays would be qualified with the phrase ‘in the West’), yet, despite being born a Jew and having devoted much of his life to the study of Islam, his burial was undertaken in St Paul’s Church. Having depended so intensively on Leitner’s passion and involvement, the Oriental Institute fell into disuse after his death, and the mosque is now the only surviving memory of this remarkable man’s ambition. It is great news that the architectural and symbolic importance of this ‘extraordinarily dignified little building’ (as Nikolaus Pevsner put it) has finally, just under 130 years after its establishment, been recognised in its Grade I listing. With Chambers’ [the architect’s] penchant for architectural flamboyance, his mosque liberally embraces Mughal architecture, the style developed by the rulers of much of South Asia from the 16th to the 18th centuries. Earlier Mughal buildings in and around Delhi display a certain classical rigour and formality. This evolved in later Mughal buildings further south around the Deccan region of India into a more expressive architectural language. While the main elements of a central large dome, large central arched portico and smaller flanking bays with arched doorways or niches remain throughout the Mughal period, in the later buildings these become noticeably more sculptural. Chambers had taken and adapted this architectural language at Woking, with a dome that is an evolution of the well-recognised onion shape into a much more spherical object. The Shah Jahan Mosque also seems to take the language of late Mughal architecture in a Gothic direction in the portico’s ogee archway and the trefoil-shaped arch over the main entrance door. The smaller domed cupola corner turret is a feature that occurs throughout the Mughal period. The stepped battlements, however, follow a style that originate in early Fatimid architecture found in Egypt in the 10th century. These seem to be the only real instances where the architect has cross-referenced architectural languages in an otherwise faithful use of Mughal stylistic heritage. The Shah Jahan Mosque almost perfectly captures the spirit of 19th-century ‘Orientalism’. This was a time when, for curious Europeans, there was a mysterious and fantastical place called ‘the East’. It was a place of strange customs, flamboyant dress and exotic women, encapsulated in a vast genre of Orientalist paintings depicting the East in theatrical ways. The Woking Mosque could be considered as the architectural equivalent of this Orientalist fantasy. 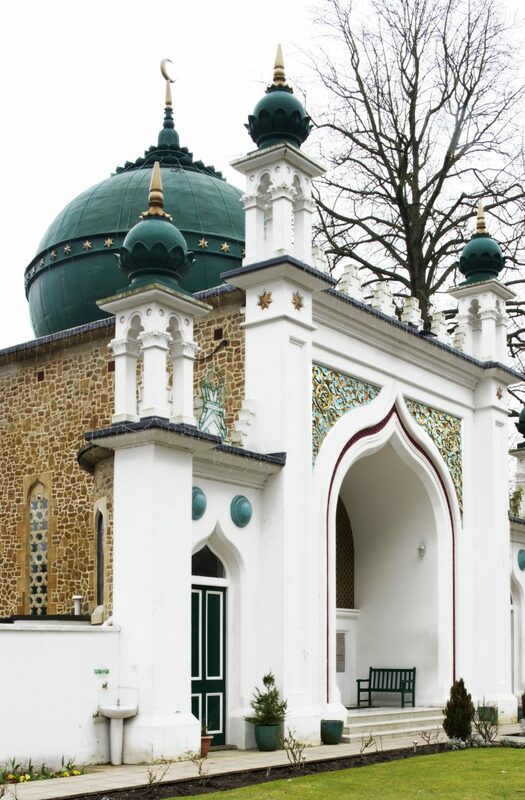 The Woking Mosque has the longest and one of the most significant histories of any mosque in Britain. Architecturally, it represents the very first manifestation of the mosque as a building type, and thus the representation of Islam, in Britain and indeed in Western Europe. The mosque enabled a Muslim social organisation to develop, which played a fundamental role in the evolution of British Muslim institutions and in the establishment of Islam in Britain. The great social changes that followed World War II, and the seismic demographic shifts in the Muslim populations of Britain, did not pass this secluded mosque by. 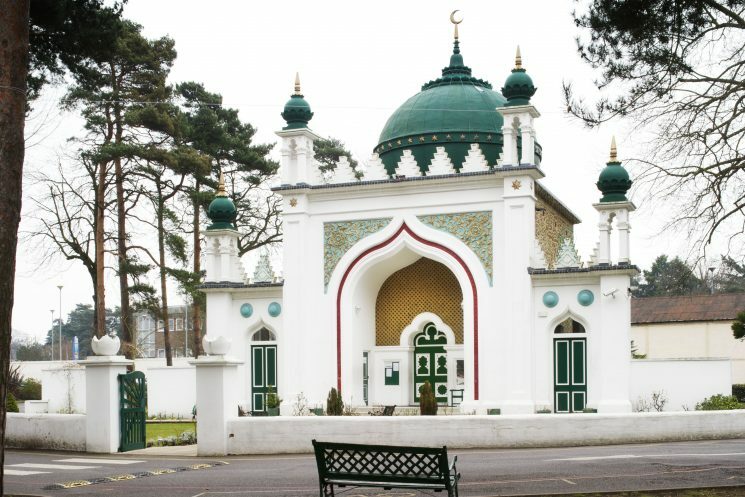 As social change came to Woking, the role of the mosque shifted from national beacon to place of local community need, and its administration and outlook came to reflect this new reality. Restored and listed, the Woking Mosque is a secure part of the nation’s heritage. 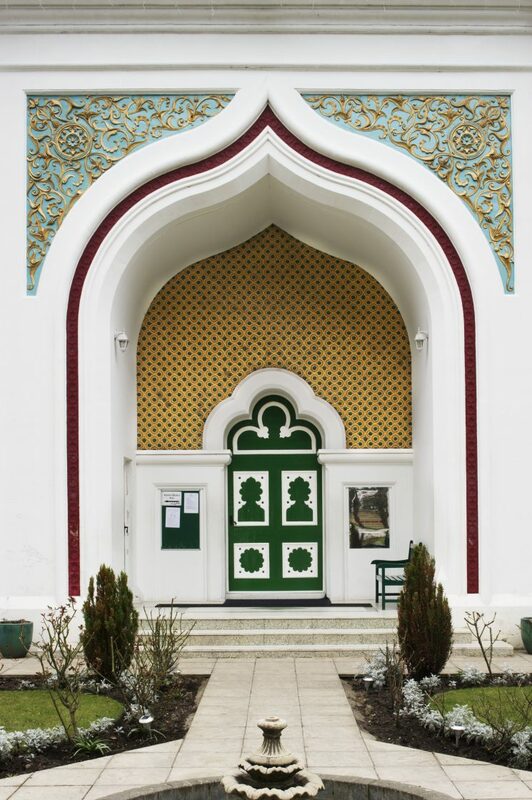 As Muslim communities and cultures become generationally embedded in Britain, and as their histories are explored and made manifest, the Woking Mosque will always be revisited as a key starting point of Muslim architectural and institutional history in Britain. from Saleem, S (2018) The British Mosque: An Architectural and Social History. The Migration Museum Project would like to thank Shahed Saleem for permission to quote from his book and Historic England for allowing us to use photographs from their collection.